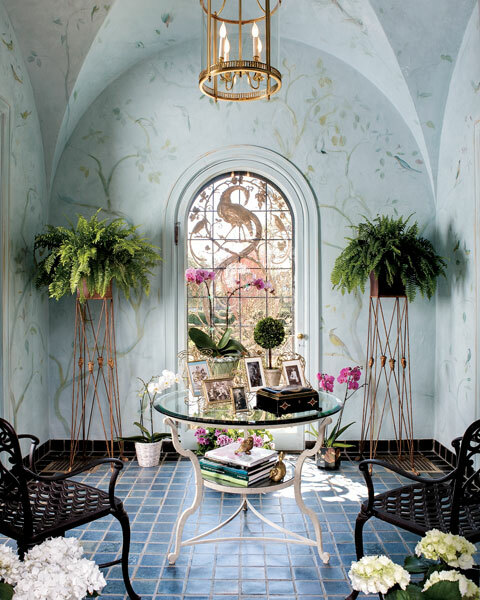 de Gournay wallpaper, the many orchids displayed throughout, the simple and unusual black and blue floor tiles and I can go on and on. The only thing I would bring with me into this room is lots of pillows for those back iron chairs, an ottoman to put up my feet, a few books and drinks. You have read this article spring inspiration with the title An Inside Garden. You can bookmark this page URL http://ourpicturewindow.blogspot.com/2010/06/an-inside-garden.html. Thanks! No comment for "An Inside Garden"